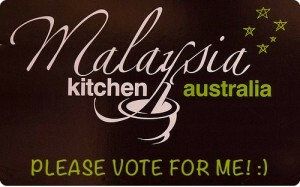 I thought I’d review my favourite place for Malaysian food, Straits. It’s located in the outer suburb of Wantirna, and is constantly busy. You used to be able to just wonder in and get a table. Now, if you don’t book, good luck to you. diced bean curd wrapped with fresh popiah skin. I loved it, and the kick of chilli, and the thin popiah skin. Popiah is a weekend special at Straits… luckily Friday is classified as the weekend! Authentic hawker style rice vermicelli and egg noodles, served in a prawn soup with sliced pork, prawns and egg. It was sweet, it was savoury, it was delicious as far as Har Mee goes. I could easily be happy with a bowl of this on a cold wintery day. Although I have fond memories of eating it in the hot Malaysian climate, sweating it out for the sake of eating delicious food. Malaysian hawker style stir fried flat noodles with prawns, squid, chinese sausage, fishcake, egg and beanshoots. Another classic dish I can’t live without when it comes to Malaysian food. Loved the addition of squid. I remember always picking out squid growing up, now I love it. Fried flat rice noodles with seafood, chicken and vegetables, topped with a creamy egg sauce. If this was the only dish they sold, I’d still go every week just for this dish. The flavours are very authentic, and we always, always, always order a plate of this. Pan friend crispy pastry filled with uniquely seasoned minced beef and onion, served with your choice of beef rendang or chicken curry. We were originially going to just order a rendang and roti, but my aunty suggested we get this instead. Boy am I glad she suggested it, I couldn’t get enough of it! I loved the mince filled ‘pancake’ and dipping it into the sauce of the rendang. I think I’ll be ordering this one quite often where I can, it was suberb! Boneless pieces of tender chicken, steamed to perfection, served with the chef’s famous chicken flavoured rice. 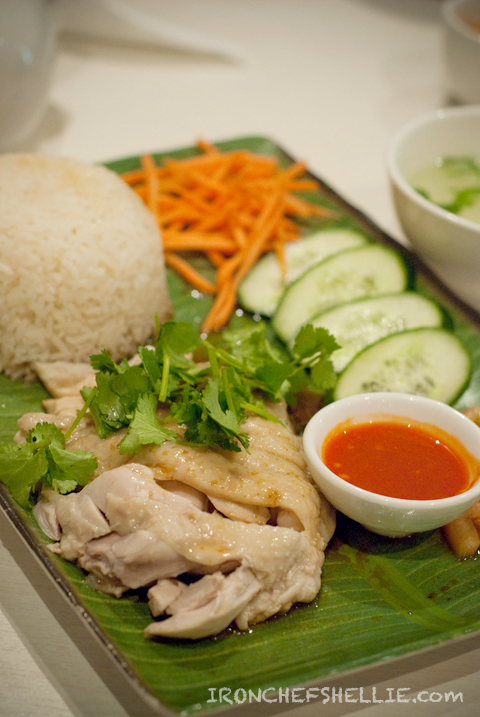 The chicken rice, and the chicken…. just perfection. I usually fight Dad over this dish, but since we had so much food this time around, there was no fight! Marinated chicken skewers with peanut sauce, on a sizzling hot plate, served with rice. It was juicy, and delicious. I only had a little taste, but they all vanished pretty quickly between the 5 of us! Unfortunately when we were ready for dessert, there were no banana fritters left! People must be coming here to enjoy bananas since they are $14/kilo! I’ll try next time to secure a banana fritter. Delicious and really hits the spot…. even better when you have it with some coconut ice cream. The coconut ice cream was lovely and refreshing. The little chunks of coconut throughout really made it something special. I combined this with the pulut hitam, and it was delicious! Overall, Straits is still one of my absolutely favourite place for a Malaysian feast. The food is consistently good, service is great, and you really get value for money. If you only try one dish here…. I’d probably say make it the Sar Hor Fun. Bookings are essential, unless you like to wait around and give people death stares as they enjoy eating their food. And a note; it’s cash only. This place is pretty far away! Oooo.. too bad about the banana fritters… HmMmm.. I can’t decide where to go next!! So many choices!! Ever Malaysian restaurant seems to serve Kickapoo. I wanted to try popiah too but only saw it after I finished eating. Will try it soon. For some reason I just imagined popiah being sweet. I was imagining a sweet pancake with roasted peanut coated in a thin palm sugar syrup and mixed with dessicated coconut. Maybe I should invent that dish? Or have I sub-consciously tried it already somewhere else? OMG THEY DO POH PIAH?! I think my parents used to come here a lot….but I LOVE POH PIAH! Must go now! Why is it so far away from me? sob sob…. Its funny how you dislike things as a kid then when you get older you wondered why you were being so stupid cos its amazing lol. Like me an mushrooms, we’re friends now. The ‘pancake’ look sooo good! I love banana fritters! I always cop a lot of flack for it; it is apparently the sell-out of Asian desserts! That popiah looks fantastically authentic, and I’ve been looking for the perfect sar hor fun for some time (the epitome of comfort food!). This place is so far away though – is it just me or do they have another place somewhere in the Fitzroy area?! Yeah it’s a family business and there is one in Doncaster. I can’t vouch for how good the food is at Doncaster as I’ve never been, but Wantirna is always good! Hmph! How did I not know there was a Straits Cafe in Wantirna?!! I wonder how long it’s been open for? I knew about the one in Doncaster. Too bad my parent’s have moved out of Wantirna now. It’s been there quite a few years now! Oh shame your parents aren’t out that way anymore! I don’t live very far to the Doncaster restaurant – I hope the food’s as good as the Wantirna one!